religious authority of the Manchu Emperor, promoted nationalism and racial unity in an effort to win support among Tibetans. Once this failed, Chinese politicians appealed to a shared Buddhist heritage. This shift in policy reflected the late-nineteenth-century academic notion of Buddhism as a unified world religion, rather than a set of competing and diverse Asian religious practices. While Chinese politicians hoped to gain Tibetan loyalty through religion, the promotion of a shared Buddhist heritage allowed Chinese Buddhists and Tibetan political and religious leaders to pursue their goals. During the 1930s and 1940s, Tibetan Buddhist ideas and teachers enjoyed tremendous popularity within a broad spectrum of Chinese society and especially among marginalized Chinese Buddhists. Even when relationships between the elite leadership between the two nations broke down, religious and cultural connections remained strong. After the Communists seized control, they continued to exploit this link when exerting control over Tibet by force in the 1950s. And despite being an avowedly atheist regime, with the exception of the Cultural Revolution, the Chinese communist government has continued to recognize and support many elements of Tibetan religious, if not political, culture. 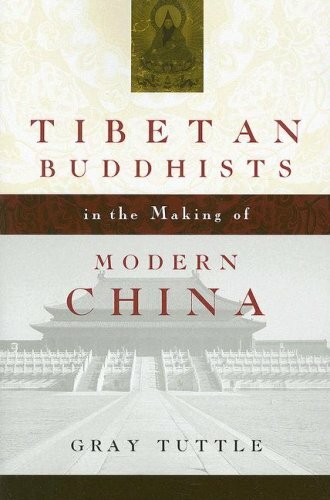 Tuttle's study explores the role of Buddhism in the formation of modern China and its relationship to Tibet through the lives of Tibetan and Chinese Buddhists and politicians and by drawing on previously unexamined archival and governmental materials, as well as personal memoirs of Chinese politicians and Buddhist monks, and ephemera from religious ceremonies. Gray Tuttle is Leila Hadley Luce Assistant Professor of Modern Tibetan Studies in the Department of East Asian Languages and Cultures at Columbia University.